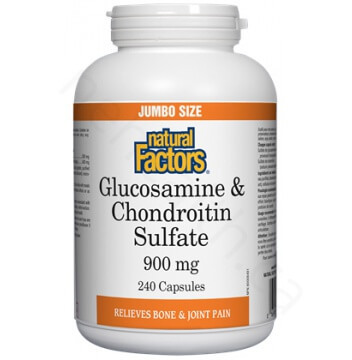 Evidence supports that Glucosamine sulfate may stimulate body joint repair, especially knee joints and may help people reduce the dosage of anti-inflammatory medication. Chondroitin sulfate is naturally found in human cartilage tissue, it perform important roles of: 1. improve cartilage and joint structure integrity 2. supplies nutrients to connective tissue 3. inhibit formation of enzymes that break down joint tissue. How Does Glucosamine Help to Ease Joint Pain and Stiffness? 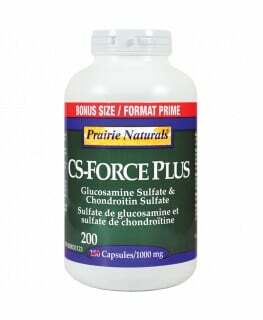 Glucosamine Sulfate is a key component of cartilage which acts as a cushion in your joints. Research suggests that Glucosamine can also stimulate the repair of damaged joints. 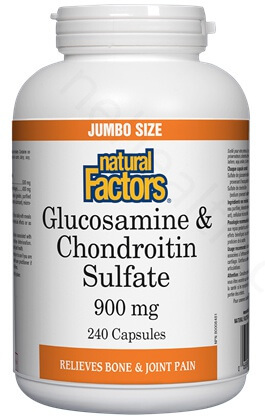 Natural Factors Glucosamine uses a mixture Glucose, Glutamine, and Sulfur to bring you superior results in comparison to other brand formulas. How Does Chondroitin Help to Ease Joint Pain and Stiffness? Chondroitin Sulfate is the most abundant component of cartilage in your body. Chondroitin acts to absorb water, giving cartilage a thicker and spongy texture, allowing forces to distribute evenly throughout the joint. Chondroitin deficiency will make your cartilage dry and brittle and without the ability to cushion impacts. Natural Health practitioners often recommend Chondroitin supplements to help reduce pain and swelling associated with arthritis. Chondroitin is also used to combat chronic conditions such as osteoarthritis. 1 capsule, 2-3 times per day with meals or as directed by a health professional.